Welcome to our complete guide to the best dog food for Boxers with sensitive stomachs. There’s nothing more worrying for a dog owner than a pup who won’t eat, especially when that pup is a Boxer. This boisterous, energetic breed is extremely playful and needs lots of food to fuel his active lifestyle. So what if your Boxer can’t, or won’t, eat? Sometimes dogs are fussy and many reasons can put them off their food. From stress to dealing with a new situation, anything can throw them off. And sometimes they are just sensitive to certain foods, or dislike the taste of others. However sensitivity can also be a sign that something is wrong. That’s why it’s a good idea to visit your vet to rule out any underlying causes of your dog’s sensitive stomach. In this article you’ll find tips and information on what your options are if your Boxer is picky with his food. In a hurry? Well, here are our top five picks from the best dog food for Boxers with sensitive stomachs. You can find reviews of these and several more great options by scrolling down. You’ll also find out how to deal with food allergies, as well as the best dog food for Boxers with sensitive stomachs. Do Boxers have sensitive stomachs? Any dog can have tummy troubles, but some breeds are more prone to food sensitivities than others. Food hypersensitivity is the third most frequent cause of hypersensitivity in dogs. 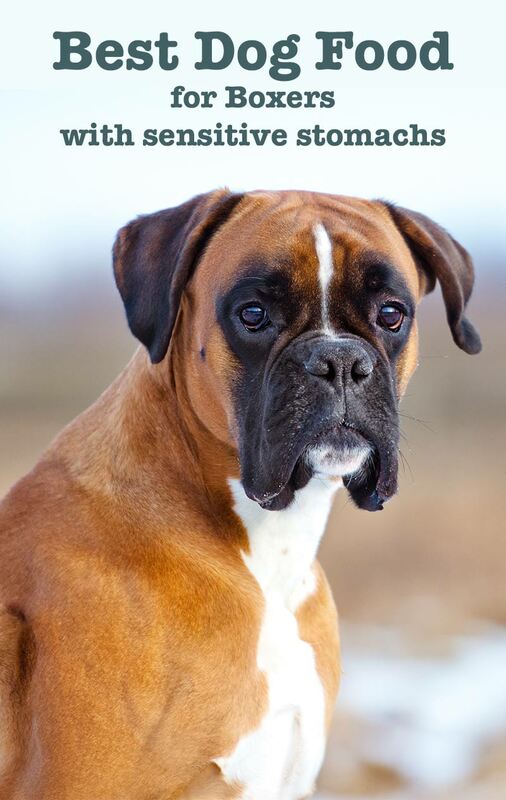 And, unfortunately, one of the breeds most likely to suffer from food hypersensitivity is Boxers. If your pet is fussy with his food and experiences digestive distress after eating, he may have a food allergy or intolerance. And don’t just think about mealtimes when treating your dog’s sensitive stomach. He could be getting into the garbage and eating something he shouldn’t. He could be sneaking treats from a neighbor. How can I tell if my Boxer has a sensitive stomach? Some detective work may be necessary to find the cause of your Boxer’s sensitivity. One of the first ways owners can treat food allergies or sensitivities is through an elimination diet. This restricts your pup’s diet to find out what his ‘triggers’ might be. An elimination diet for dogs is typically limited to lamb, chicken, rabbit, horse meat and fish as sources of protein. It can be bulked up with either rice or potatoes. If your Boxer does better on this simple diet, then he almost certainly has a food allergy. If this is the case you may want to consult with your vet to develop a feeding plan. Your vet will also be able to give you information on allergy testing. Although sometimes expensive, this can be very helpful in pinpointing your dog’s issues. It’s possible you may have to experiment with brands and flavors before finding something that agrees with your dog. Be patient and introduce new foods slowly. Most people choose either dry food or wet food for their dogs, but you could also consider trying a raw food diet. Many owners have experimented with this diet, believing it to be less processed and more natural. It can be particularly beneficial for dogs with digestive issues as many react to the ingredients and additives in processed food. However, raw feeding is not for everyone and it does have some downsides. Fortunately, there are several options which could prove to be the best dog food for Boxers with sensitive stomachs. When it comes to picking kibble for your sensitive Boxer, always check the label. Always try to buy the best quality dog food available. Look at any clinical studies carried out on the specific product, or see if the manufacturer has a veterinary nutritionist on staff. If in doubt, contact the manufacturer. They should be forthcoming with their nutritional information. 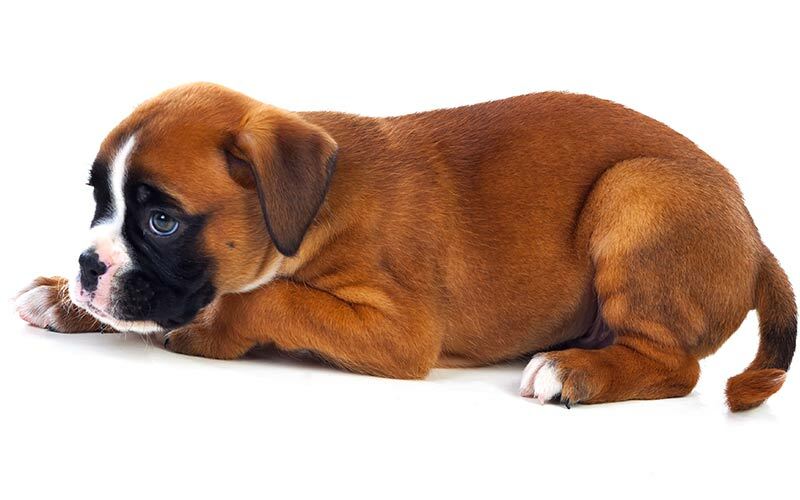 Here are a few options that are well received by owners of Boxers with sensitive stomachs. 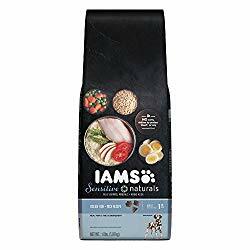 IAMS Sensitive Naturals is specially formulated for dogs with food sensitivities. It contains real fish, rice and vegetables. It is also fortified with vitamins and minerals to ensure your dog gets all the nutrition he needs. 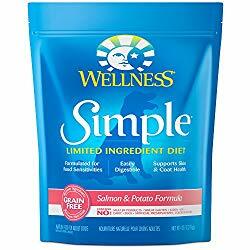 Wellness Simple is made with only five ingredients and contains prebiotic fiber and probiotics so it is easily digestible. It comes in duck, lamb, salmon and turkey to give your picky pup a range of protein options. 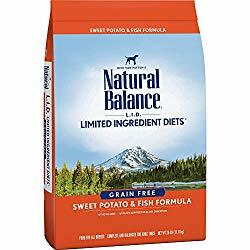 Natural Balance’s Limited Ingredients brand gives dog owners a chance to get their pups a completely balanced diet, without exposing them to potential triggers. They are also grain-free and contain no artificial colors, flavors or preservatives. If you think you Boxer would do better with canned food, or a mix of canned and kibble, there are products available especially for sensitive dogs. Hill’s Science Diet has long been considered by vets to be one of the leading manufacturers of hypoallergenic pet food. And it has a great option for adult dogs. The salmon and vegetable mix claims to be great for your dog’s digestion, and his skin. If introducing it for the first time, the manufacturer advises mixing it with the old food for at least a week to let your dog adjust. 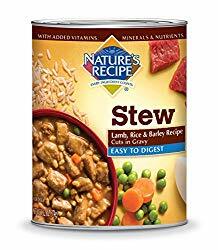 Nature’s Recipe has a dog ‘stew’ that sounds good enough to eat. Labelled as ‘easy to digest’ this canned food contains lamb, rice and barley in gravy. It also comes in a chicken variety. Some dogs love nothing more than slurping up a bowl of soup or broth. If your Boxer loves anything with gravy then try him with some easily-digestible wet food options. 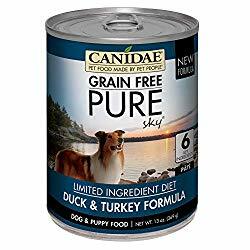 If your pup can tolerate poultry, Canidae has a turkey and chicken formula. It is grain-free and simmered in duck broth to tempt your dog’s taste buds. 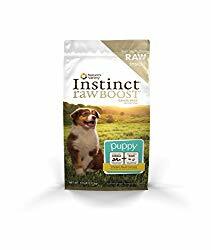 Nature’s Variety Instinct range also has a turkey formula that is made with one protein source and no grains. It also avoids common allergens like dairy and eggs. The nutritional needs of a puppy are different from those of a senior dog. That’s why it’s important to feed young pups age-appropriate food. This also applies when you’re looking for the best dog food for Boxers with sensitive stomachs at a young age. Nature’s Variety has a high-protein, grain-free kibble for puppies. The main protein source is chicken and it also contains added vitamins and minerals such as natural DHA to support your dog’s brain development. 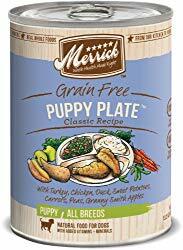 Merrick Classic Puppy Plate is a grain-free, wet puppy food. It is cooked in the USA and has no gluten so it’s more gentle on sensitive stomachs. As senior dog’s energy levels dip, so too does their food intake. And their diet has to reflect their changing health needs. Older animals need a different balance of vitamins, minerals and additives like chondroitin to help keep them healthy into their twilight years. 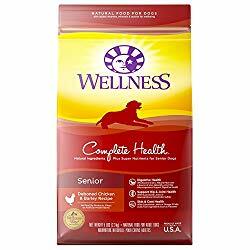 Wellness Complete Health has probiotics, prebiotics and chicory root extract to help your senior dog digest its chicken and barley formula. 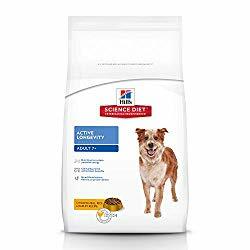 For dogs aged 7 and up, Hill’s Science Diet makes an Active Longevity dry food. Made from chicken, rice and barley, it is made in the US with easy to digest ingredients. 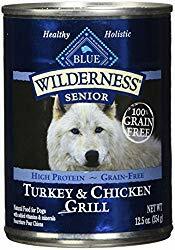 If your senior dog prefers wet food, try Blue Wilderness’ grain-free chicken. It contains chicken and turkey and no meat by-product. As well as a blend of vegetables, fruits and micro-nutrients designed to aid digestion. 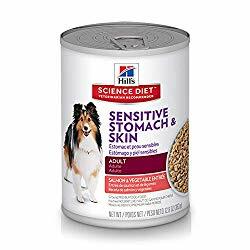 What is the best dog food for Boxers with sensitive stomachs? Choosing dog food for Boxers with sensitive stomachs can be tricky. It may involve a lot of trial and error. The first step is to limit the ingredients to try and ascertain what it is that’s upsetting him. When introducing new foods to your dog, it’s important to be patient and transition slowly. Give the dog at least a week to see if there are any adverse reactions to the new food. And if you notice any new symptoms such as vomiting or diarrhea see a vet immediately as these could be signs of a serious problem. Ultimately the best food for Boxers with sensitive stomachs is the one that suits your lifestyle, your budget, your dog’s taste buds and most importantly boosts his overall health. Do you have a Boxer with a special diet? Let us know in the comments! Wills, J, Harvey R, “Diagnosis and Management of Food Allergy and Intolerance in Dogs and Cats”, Australian Veterinary Journal, 1994. My Dog Ate A Battery! What Should I Do About It?